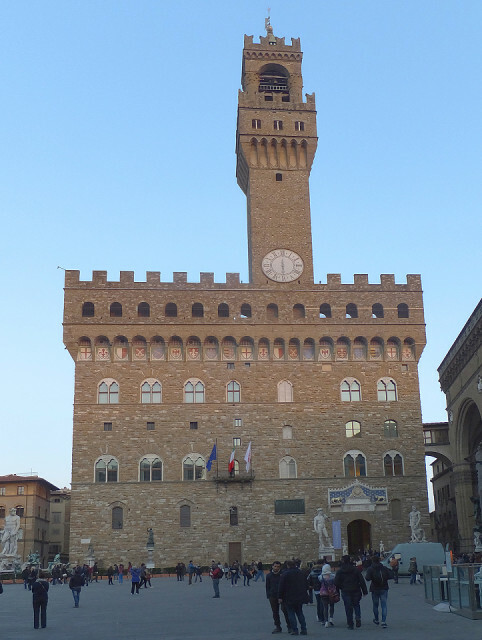 This is the town hall of Florence, marking the center of the city along with the Duomo which I blipped day before yesterday. I had been reluctant to continue with architectural images for the city, but this late afternoon shot struck me, especially with its unconventional straight-on perspective. Below the tower is Michelangelo's David--a reproduction; the original is in the Galleria dell' Accademia. We were returning from a long and wonderful visit to the Basilica of Santa Croce, especially notable for a wide range of early Renaissance frescoes. In the morning we went to Santo Spirito, which was disappointing; I loved it in the 1960s, but its classical Renaissance interior seemed somewhat overdone this time.